Savings plan with low opening and maintaining balance that provides trouble-free fund monitoring. Php2,000.00 minimum required maintaining balance. 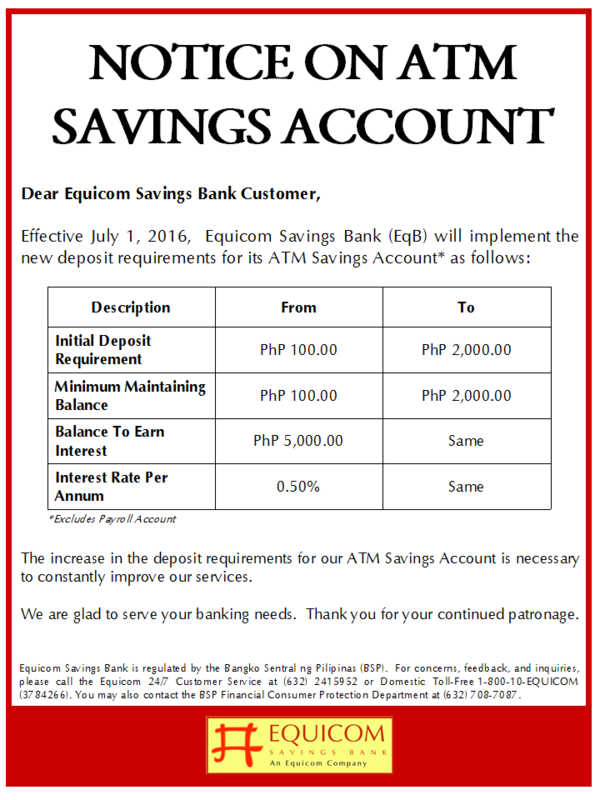 Php 5,000 minimum balance to earn interest 0.50% interest rate p.a. Maximum withdrawal limit per transaction via EqB ATM is Php 25,000.00 and has a maximum limit of Php 50,000.00 withdrawal per day. Withdrawal at non-EqB ATMs is subject to other bank’s ATM withdrawal limit. An interest bearing passbook savings product designed for young achievers with high interest rate. 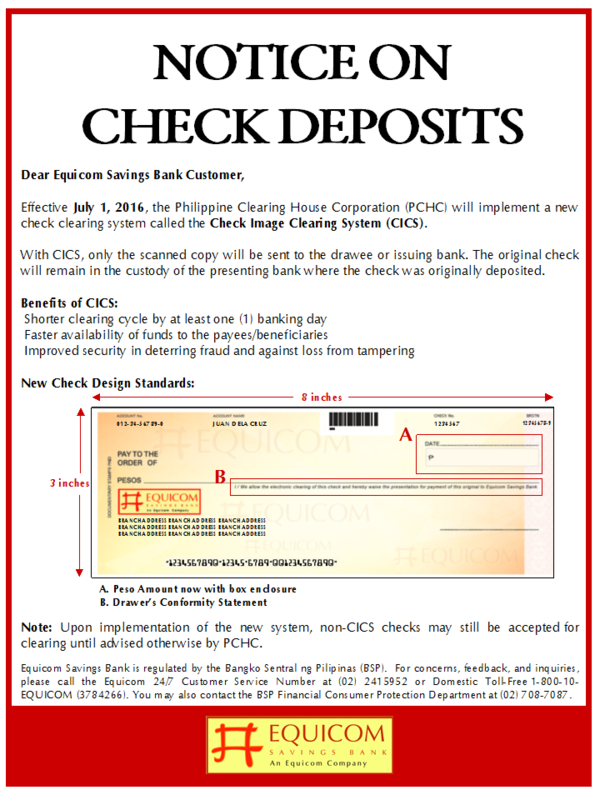 A simple and uncomplicated product that manages your payables with the convenience of check issuance. Linked savings account 0.50% interest rate p.a. Risk free investment that maximizes your savings with high-yield interest. Worldwide Recognition. Your Equicom Credit Card is accepted in more than 31 million Visa accredited establishments worldwide. Dual Currency Billing. Get two credit limits in one credit card; a Peso for your local purchases and a Dollar limit for all your purchases abroad. Super Check Facility. 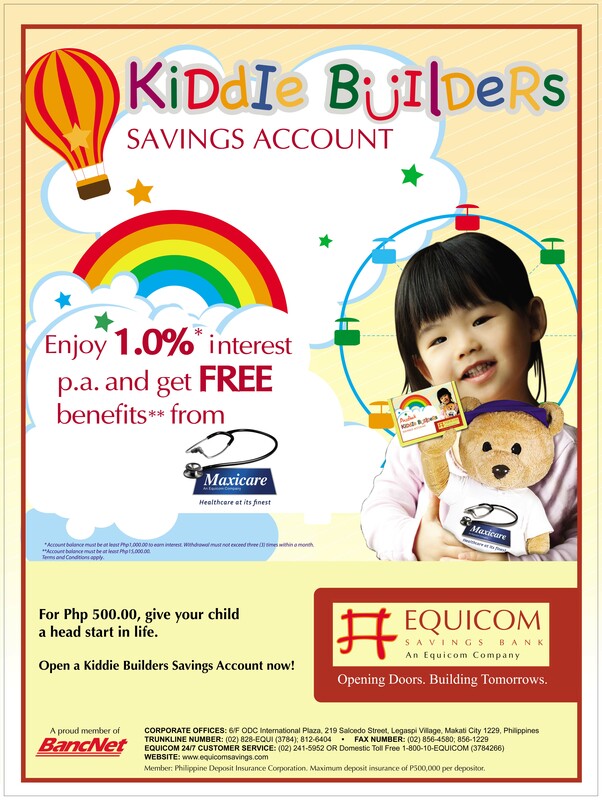 A super convenient payment alternative exclusive to your Equicom Credit Card. Let’s you issue checks up to 100% of your Card’s available credit limit. So whether you need cash or pay for life’s big events, Super Check makes it easy for you. A low service fee of 1.5% for every check issuance applies. Equicom Cash Deals Facility. Get instant cash and pay for it in easy installment terms. Payment Deals. Enjoy a separate credit limit for your installment purchases. Have the option to purchase on installment at participating merchants or convert all your straight purchases to easy installment payment schemes at very affordable rates. Balance Transfer Facility. Transfer your other credit card balances to your Equicom Credit Card and enjoy easy and affordable monthly payment terms. Rewards Program. 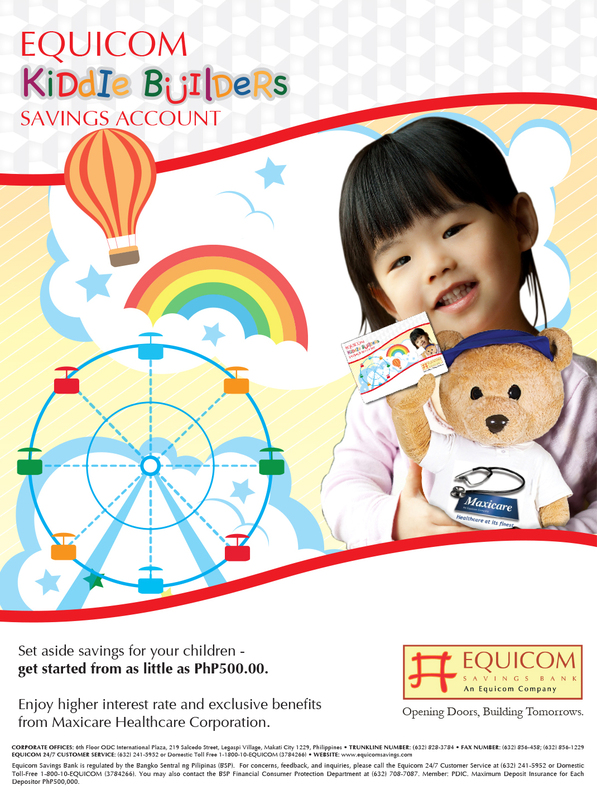 Earn one (1) Key Point for every Php300.00 or its dollar equivalent on your Equicom Credit Card purchases. 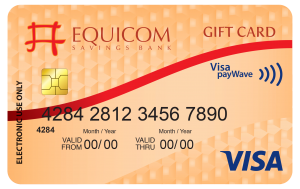 Use your earned points to shop and dine at any Visa merchants worldwide via the Equicom Gift Card. Unlimited Supplementary Cardholders. 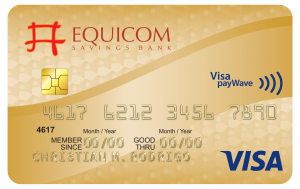 Share the benefits of your Equicom Visa Credit Card and enroll as many Supplementary Cards as you want for your loved ones and assign monthly sub-limits for each Card. Auto Bills Facility. Enjoy the convenience of paying your monthly bills in just one step. 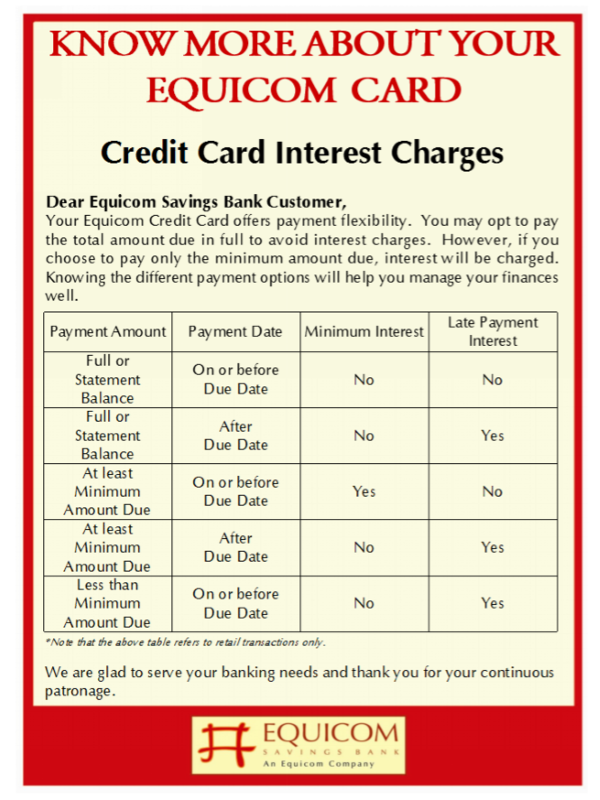 Let Auto Bills consolidate every bill into one by charging it to your Equicom Credit Card. Enroll today and forget the hassle of having several payment due dates. Flexible Payment Terms. 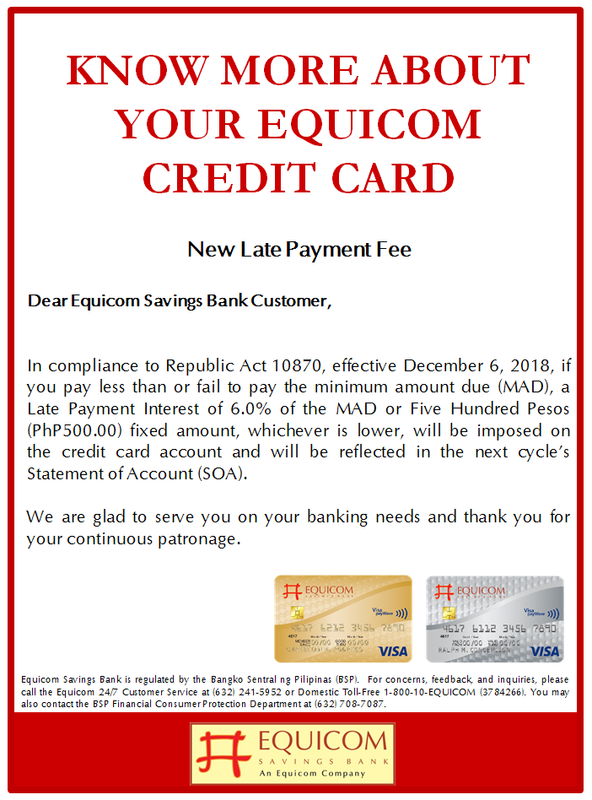 Pay only 5.0% of your outstanding balance or P500.00/USD50.00, whichever is higher, and enjoy low finance charges computed based on average daily balance. Convenient Payment Centers. 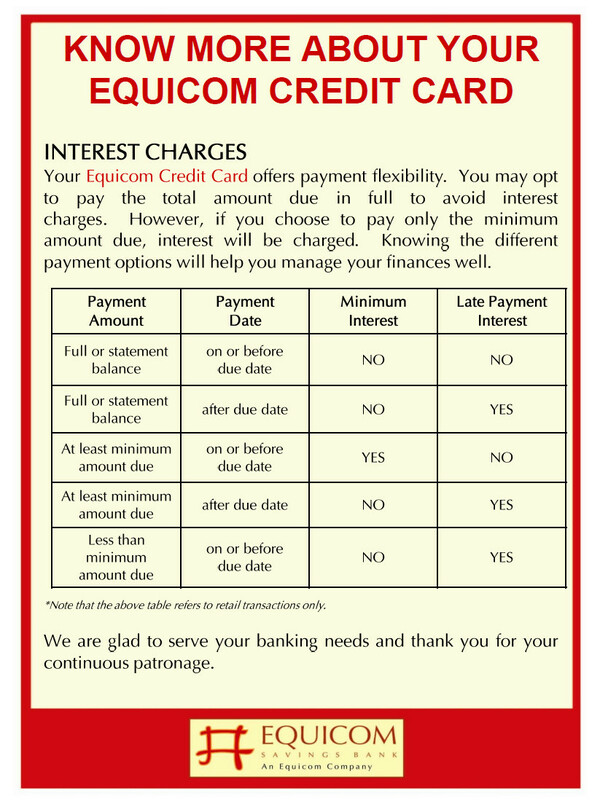 Settle your Equicom Credit Card balances through over-the-counter at any Equicom Savings Bank branch, through Equicom Auto Debit Facility, Mobile Banking Facility or through accredited payment centers nationwide. 24/7 Customer Service. 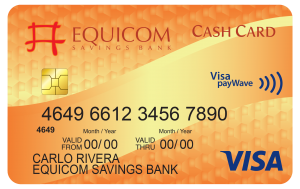 For inquiries regarding your Equicom Credit Card, call the Equicom Customer Service at (632) 2415952 or Domestic Toll-Free Number 1-800-10-EQUICOM (3784266). NOTE: Cash Advance Fees Apply. An ATM Card you can shop with! With your Equicom Key Card, you can dine and shop at over 31 million Visa establishments worldwide. Enjoy enhanced purchasing power with a daily purchase limit** of Php40,000 for your Peso-linked accounts. 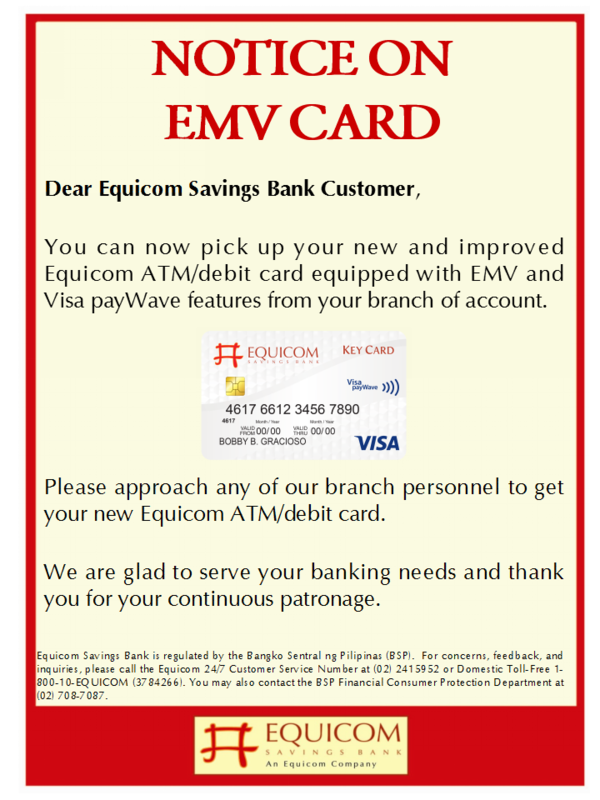 Access your account anytime by enrolling to the Equicom Mobile Banking facility or log in at www.equicomsavings.com. 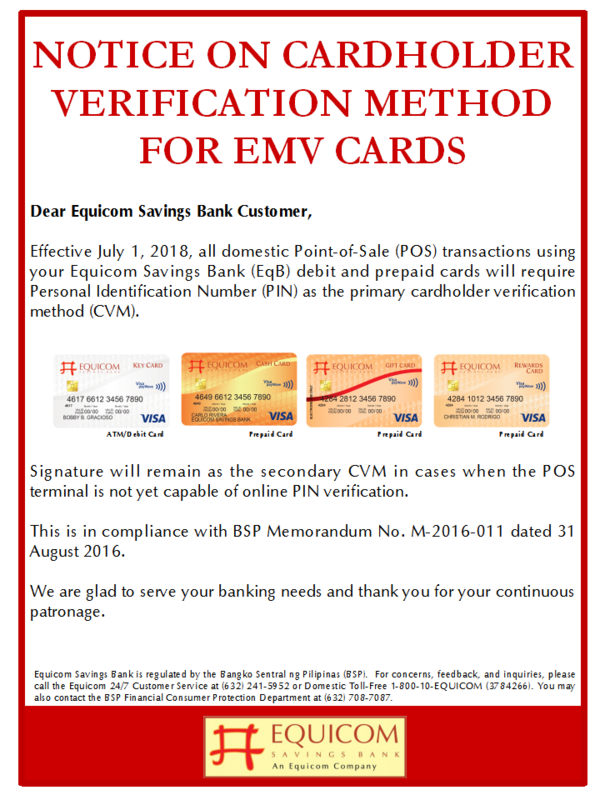 For lost or stolen card, immediately call our Equicom 24/7 Customer Service at (632) 2415952 or 1-800-10-EQUICOM (3784266) or via eqbcustomerservice@equicomsavings.com.ph. *Applicable ATM fees shall apply. **Increase in Point-Of-Sale (POS) daily purchase limit shall be allowed upon Accountholder’s request. All the advantages of a debit card without having to open a deposit account. Recognized and Accepted Worldwide. 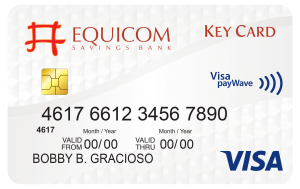 With your Equicom Key Card, you can shop, dine and pay your bills at over 31 million Visa establishments worldwide. 24/7 Customer Service. 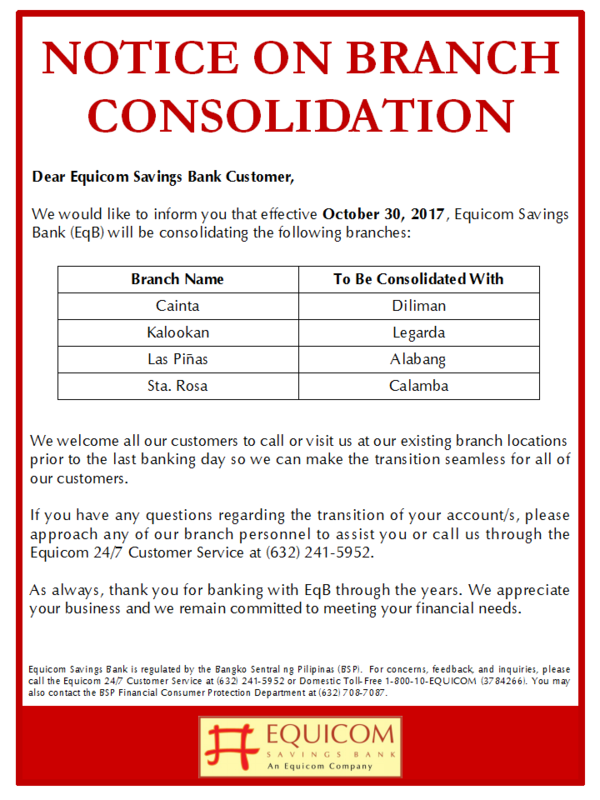 For concerns and inquiries, just call our the Equicom 24/7 Customer Service at (632) 2415952 or 1-800-10-EQUICOM (3784266) or email eqbcustomerservice@equicomsavings.com.ph. Our friendly and efficient Customer Service Representatives will be more than happy to assist you. Mobile and Internet Access. 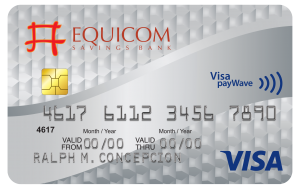 Access your card balance through the Equicom Mobile Banking service by typing “INQ Card Number” (INQ 4649123456789010) and send to 0918-818-EQUI (3784) or through www.equicomsavings.com. Reload Anytime. 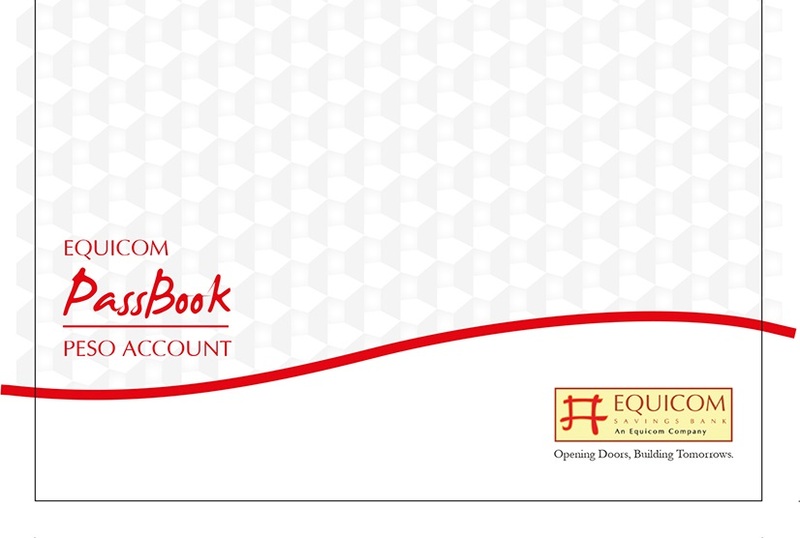 Simply visit any Equicom Savings Bank branch to reload your Equicom Cash Card. ** It is not a deposit account, non-interest bearing and is not insured with the Philippine Deposit Insurance Corporation. ***Monthly maintenance fee of P100.00 will be charged starting on the 13th month of inactivity. Give your loved ones the gift of choice! Give it for birthdays, holidays, weddings, graduations – whenever! Give it out as rewards or incentives! Shop, Dine and Unwind at over 31 million Visa establishments worldwide. 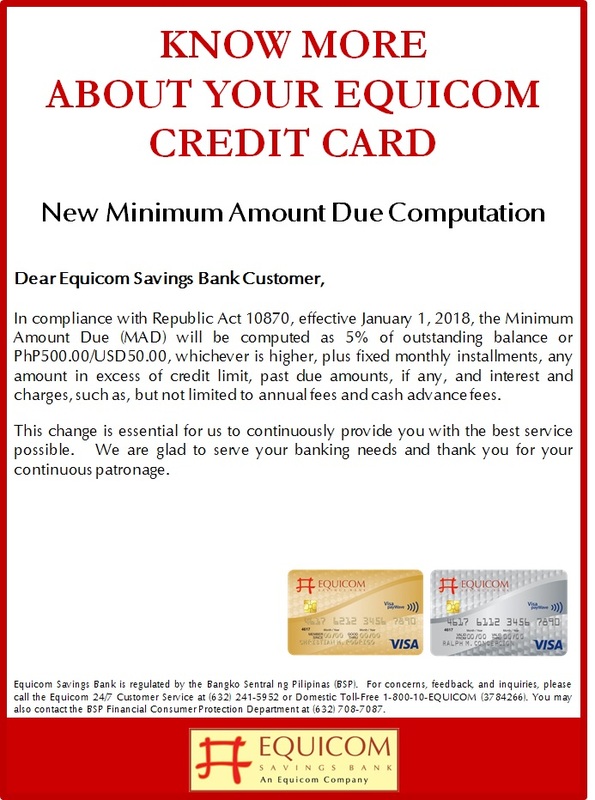 To inquire on your available balance, simply text “INQ Card Number” (INQ 4284123456789010) and send to 0918-818-EQUI (3784) or contact the Equicom 24/7 Customer Service at (632) 2415952 or Domestic Toll Free Number 1-800-10-EQUICOM (3784266). 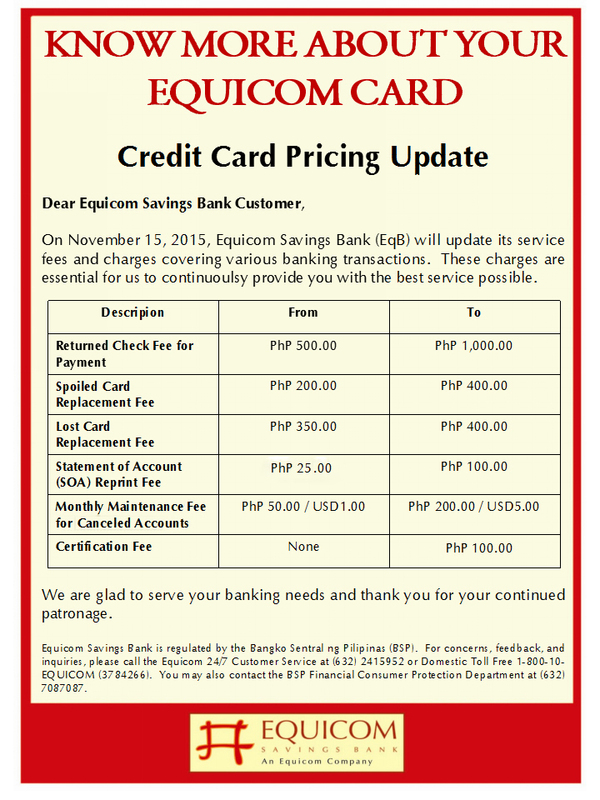 The Equicom Gift Card has no ATM access. Lost cards cannot be replaced. It is non-interest bearing and is not insured with the Philippine Deposit Insurance Corporation. Monthly maintenance fee of P200.00 will be charged starting on the 13th month of inactivity. The Medilink XP Visa Prepaid Card is a comprehensive solution that covers the whole gamut from card issuance to payment settlement. To date, the Medilink XP Visa Card is accepted at more than 500 Hospitals nationwide and all merchants that accept Visa. 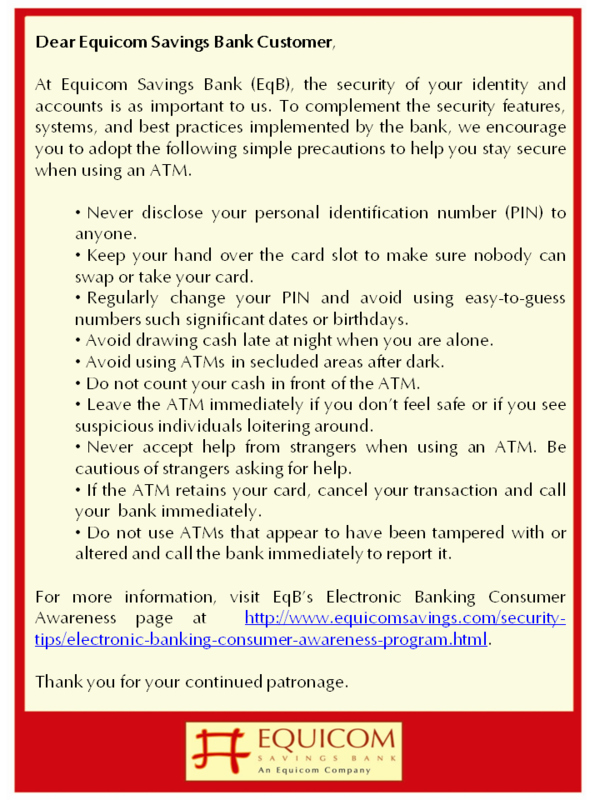 For your protection, here are tips on how to take care of your Credit, Debit and Prepaid Cards. 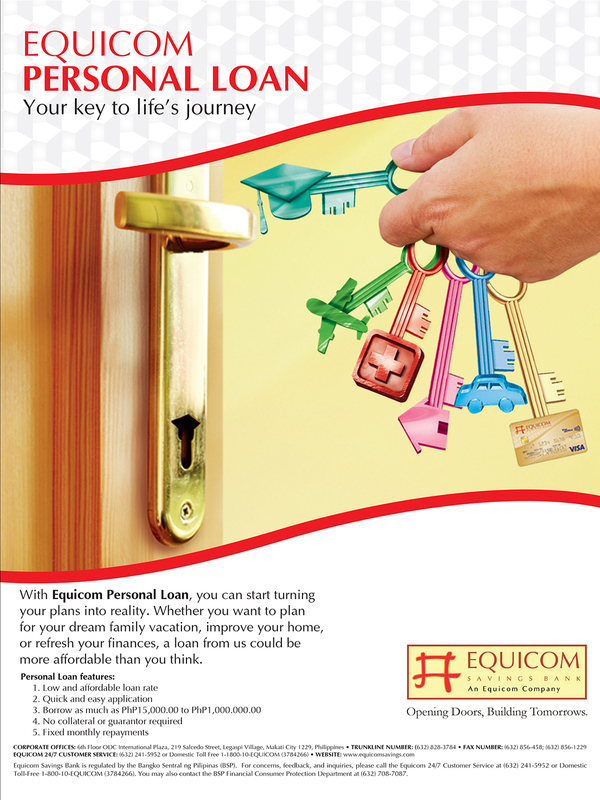 With Equicom Personal Loan, you can start turning your plans into reality. Whether you want to plan for your dream family vacation, improve your home, or refresh your finances, a loan from us could be more affordable than you think. Apply now for an Equicom Personal Loan! 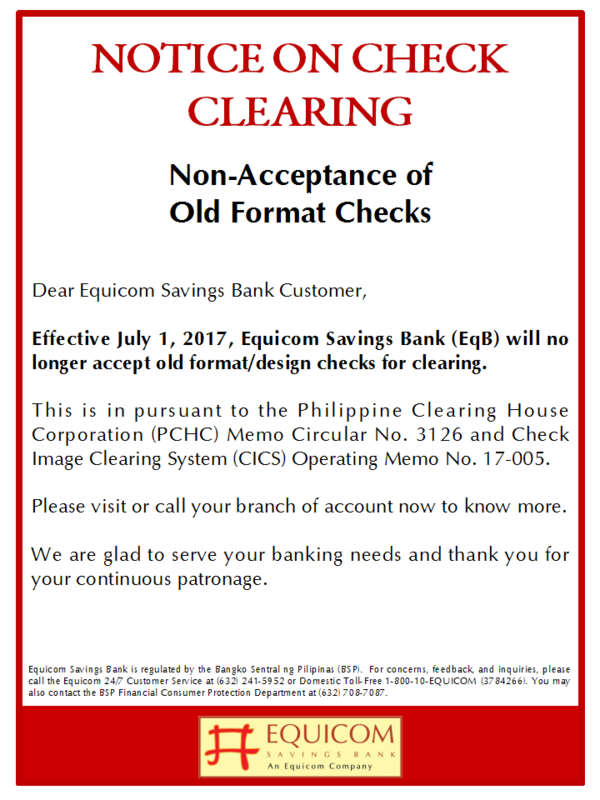 Get instant decision when you submit your fully accomplished and signed application form and requirements via email at EQBCCSD-AC@equicomsavings.com.ph. Lines are open Monday to Friday 8:30 a.m. to 5:30 p.m. Whether it’s a dream holiday, new car, or for your child’s tuition, you can use your Equicom Salary Loan for almost anything. We offer affordable and flexible housing loan for today’s home hunters. Whether you want to purchase an under-construction property or refurbish a pre-owned house or build your own, the house of your dreams can now be yours with an Equicom Home Loan. A multi-purpose credit facility specially designed to provide the financing requirements of growing small and medium usinesses and entrepreneurs. Real-time balance inquiry for enrolled cards and accounts. 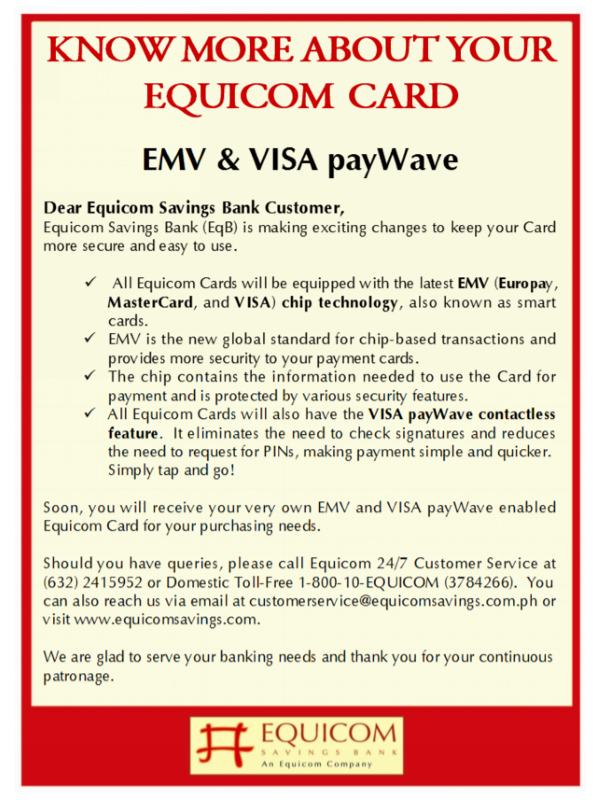 All types of Equicom cards (ATM key card, Equicom credit card, prepaid Equicom cash card and prepaid Equicom co-branded cards, and Equicom gift card) may be enrolled. Any period up to 90 days within the past 12 months. With month-to-date statements, you can view even your most recent approved transactions anytime anywhere. 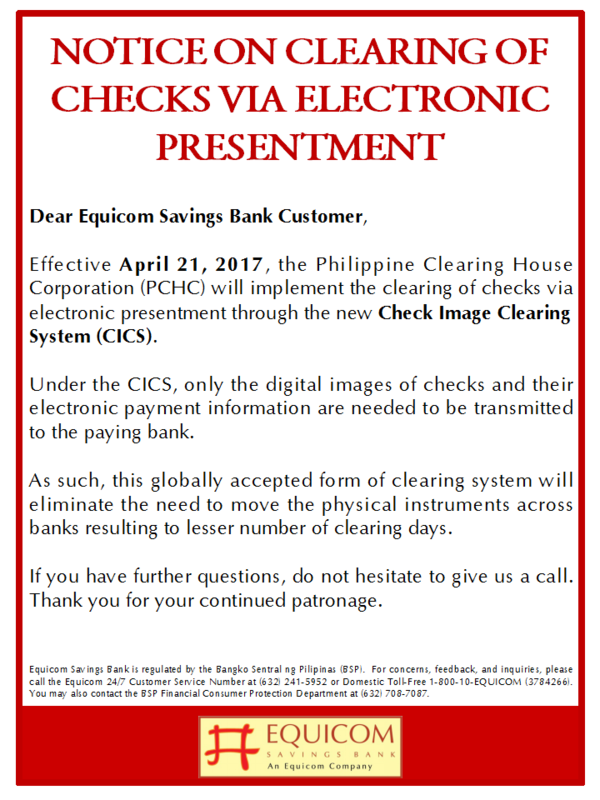 Best of all, you may view both front and back images of the checks that you issued from your checking account. Access internet banking through the EqB website. 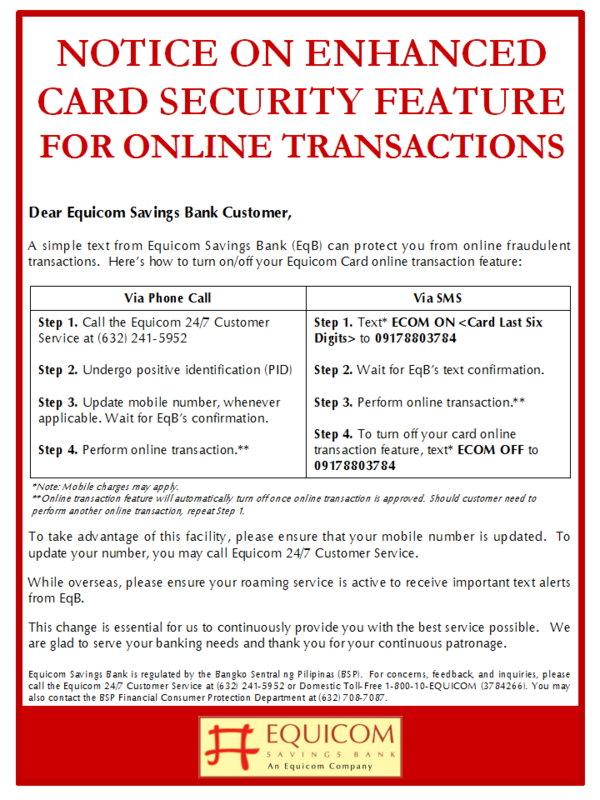 Click on the internet banking link at the top right corner of the home page to open the Equicom Online main page, where you may then begin enrolment or login and safely conduct your transactions in a secure environment. Enroll online by clicking on “Enroll now!” then follow and accomplish the registration process. Please note that corporate authorized users will need explicit board approval to access the corporate account/s as a single user. Got more questions? 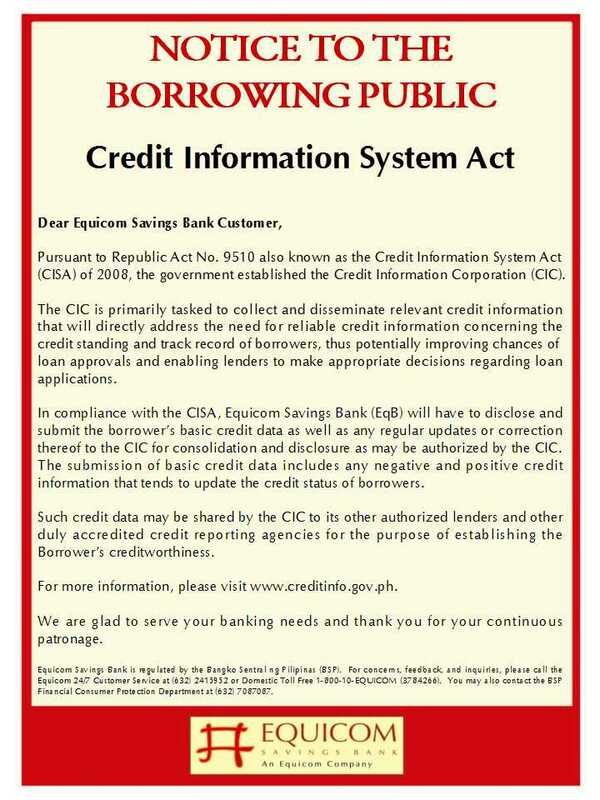 Refer to the Frequently Asked Questions about Internet Banking. 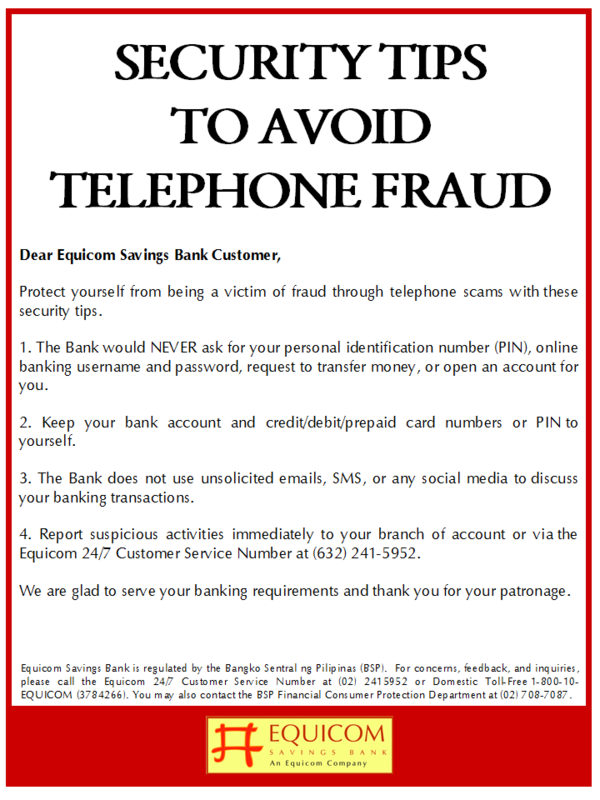 For more information, please contact the Equicom 24/7 Customer Service at (632)2415952, Domestic Toll Free Number 1-800-10-EQUICOM (3784266) or visit your Equicom branch or email us at. 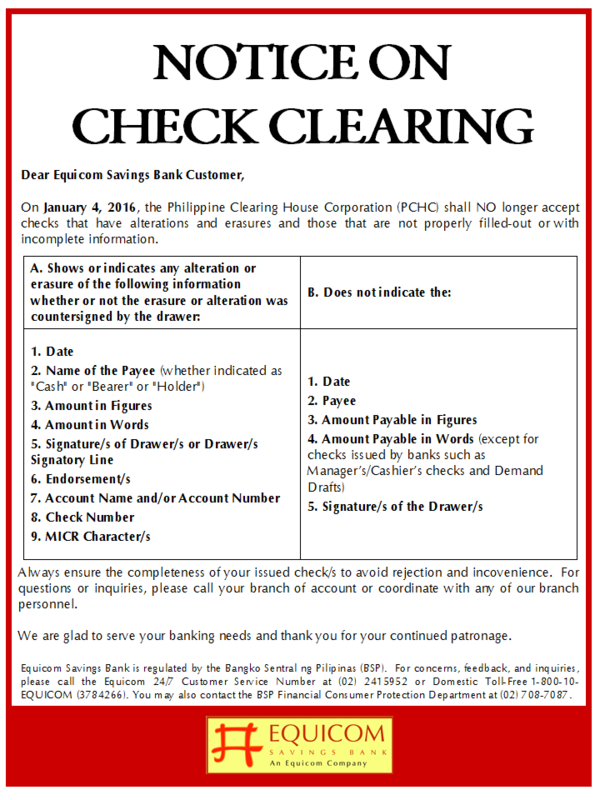 *Note: The forms can be accomplished, saved and printed for you to sign and submit to your branch of account. 24×7 banking convenience at your fingertips. 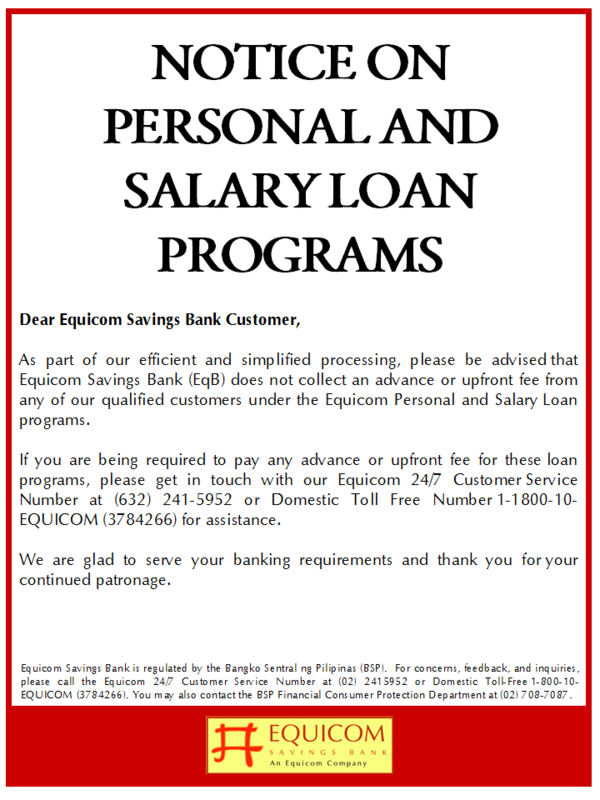 Enroll for mobile banking service at your Equicom Savings Bank branch. Any mobile phone and telco provider may be supported. Simply text the transaction commands to 0918-818-EQUI (3784). 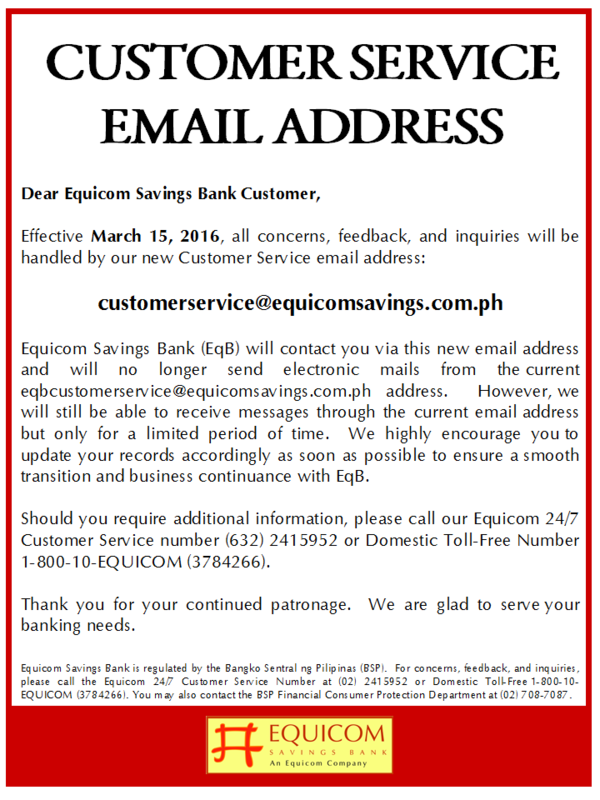 SMS Commands (EqB Mobile Banking number is 0918-818-EQUI (3784)). 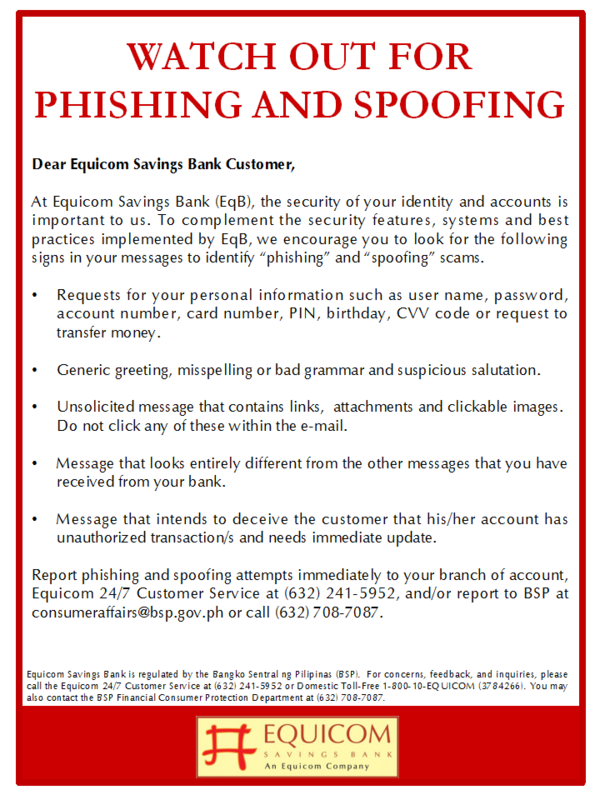 For more information, please contact the Equicom 24/7 Customer Service at (632)2415952, Domestic Toll Free Number 1-800-10-EQUICOM (3784266) or visit your nearest Equicom Savings Bank branch or email us at. 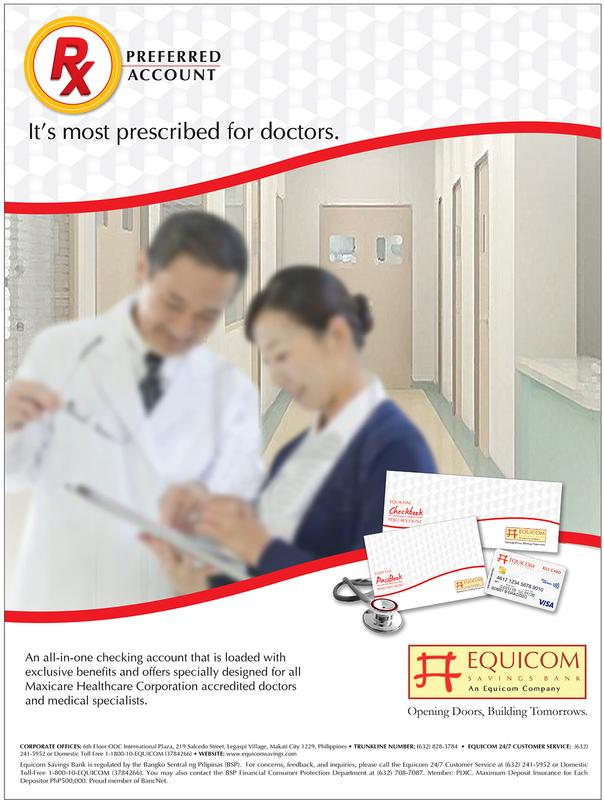 Equicom Savings Bank accepts premium payments for Maxicare Healthcare Corporation and bills payments for Meralco and PLDT.